Added by Bill Bowman on March 12, 2019. 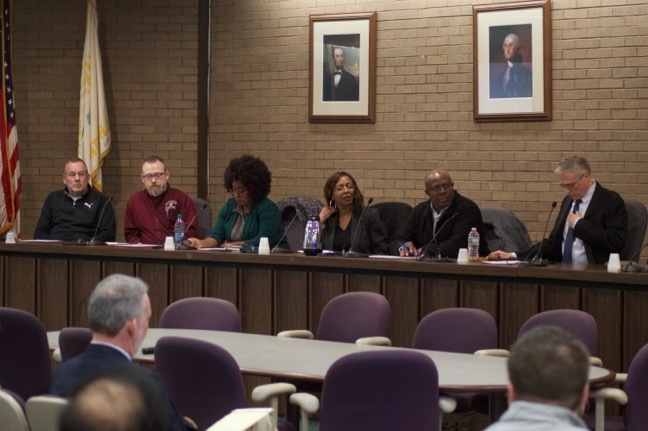 The Hamilton Street Advisory Board and Township Council held a joint meeting about student housing projects on March 11. A proposed 362-bedroom student housing project on Hamilton Street could pump as much as $1.7 million a year into the local economy, a consultant said March 11. In 10 years, that same project could generate as much as $6.2 million in direct and indirect economic activity, consultant Todd Poole told a joint meeting of the Hamilton Street Advisory Board and Township Council. Poole, along with two associates, was hired by the township to make recommendations about parking requirements for student-targeted housing and to talk about the economic impact to the township of student housing. The trio used a project proposed by township resident Dean Adi, targeted for the block bordered by Hamilton, Home and Jefferson streets and Highland Avenue, on which to model their findings. Adi said after the meeting that he did not know when the project would be brought to the township for approvals. Vince Dominach, the executive director of the advisory board, said the meeting’s purpose was to review the consultants’ findings and to get residents’ input. “Number two, we wanted to look at the economic impacts,” he said. Poole said the proposed project’s economic impact was calculated by determining what a typical student would spend in a year. “As a result, the direct economic impact, labor, income produced, economic value, represents $1.3 million in one year, once all the students are here,” he said. The combined economic impact, Poole said, could be as much as $1.7 million a year. The differences between this proposed development and others under construction in the Hamilton Street business district is that the Adi project would have no retail component, and would be able to rise to five stories. “We’re not talking about going to five stories for every other type of development, or five stories for the rest of the town,” Dominach said. Parking consultant Jim Zullo said the parking recommendation for a project the size of Adi’s would be about 215 parking spaces, if the developer did not include any type of parking management plan. Those plans include subsidizing Uber and Lyft rides, providing a shared-car program or a bike-share program, or leasing or buying nearby property for overflow parking. With such a parking management plan in place, Zullo said, the recommendation for total parking spaces would be lowered to 172. Zullo said that analysts looked at student housing parking in other towns, such as Highland Park and New Brunswick, to get an idea about the needs of student parking. Zullo said it was important to not over- or under-estimate the number of parking spaces needed. Zullo said that students don’t rely on cars to get around now as much as they did in the past with other options available, such as Uber and Lyft. Township Councilwoman Crystal Pruitt took issue with Zullo’s statement, saying that she falls into that age group and that cars are necessary in Franklin. A number of residents who live on streets abutting Hamilton Street said they were concerned about traffic issues and about building tenants parking on their streets. Their concerns were addressed by Township Manager Robert Vornlocker. Vornlocker said he could use township engineering interns to do tasks such as street inventories to document drainage signage and curbing on the side streets. The $80 million to $90 million project as proposed by Adi would be comprised of 16 one-bedroom units, 122 two-bedroom units and 34 three-bedroom units. Adi said that he would work with neighborhood residents in the project’s development. Mayor Phil Kramer said that changes to Hamilton Street are inevitable. Kramer said the township doesn’t have the money to do all the projects residents want to improve the Hamilton Street corridor, but projects such as Adi’s could help bridge the gap. “I do not want to gentrify, but I want to bring more money into the area, bring in more jobs to the area, so the people of that area benefit so they have more resources, they have more jobs and we can grow,” he said. Deputy Mayor James Vassanella read off a laundry list of concerns he said have been told to him by area residents, including needing a special lane for increased package deliveries and for pick-up and drop-off by driving services, parking for student parties and for employees of new businesses brought in, parks and other green space, a plan too incorporate bus stops and drivers cutting down side streets to avoid Hamilton Street traffic.